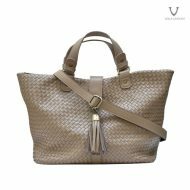 Voila Bonita Leather Tote Bag is made of the latest cow leather material, Sponge Cow Leather. With its original, authentic, soft, tender, supple, flexible, sponge-like leather character, and the slightly orange tobacco brown color, this sponge leather bag looks eyecatchy and classy. Voila Bonita has 5 available colours; the Tobacco and Maroon are made of slightly doff sponge cow leather, while the Elegant Black is also slightly doff but made of premium crazy horse leather, the Blue Navy is made of slightly glossy, authentic premium softy nappa cow leather, and the Havana is made of glossy, slightly stiff, non-rigid, scratch textured pull up cow leather. Voila Leather launch a new tote & crossbody bag combination named Voila Bonita, a tanned color, medium sized bag made of the latest cow leather material, Sponge cow leather. With its original, authentic, soft, tender, supple, flexible, sponge-like leather character, and the slightly orange tobacco brown color, this sponge leather bag looks eyecatchy and classy. 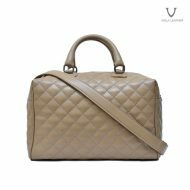 Voila Bonita trully is a beautiful, elegant, simple, medium sized leather bag designed elegant, vintage and simple in rectangular shape with bold line stitch on its right and left side, and its handle that is also complemented with a vintage large buckle. Voila Bonita also come with a detachable and adjustable sling / shoulder strap for more option carrying the bag. Voila Bonita, a leather bag designed elegant, vintage, simpel, medium sized made of the latest cow leather material, sponge cow leather that is supple, flexible, soft, tender, sponge-like textured – perfect for your everyday daily bag, like going to the office, hanging out with friends and relatives, and so forth. 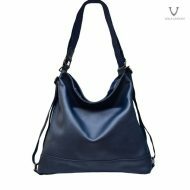 If you are looking for a classy, elegant, simple, medium sized tote & crossbody leather bag, Voila Bonita is the right choice.